If you want help on the journey to "AND", check out any of our Free Courses. Most of us have been conditioned to make trade-offs. I can have work-life balance OR financial success. Meaning OR money. But both? We don’t even consider it an option because we are trapped in the world of “or.” Unfortunately, this “or” thinking is now so firmly entrenched in our culture that it’s showing up in all aspects of American life (win or lose, good or bad, liberal or conservative). I believe it’s this limiting “or” thinking that caused Oxford Dictionary to select the word “toxic” as the most used word of the year. Seriously, “or” thinking is literally making our world, and us, toxic. That is unfortunate. “Or” thinking is a trap. It’s not the way our lives were meant to be lived, so we certainly should not settle for it. Why do we automatically assume there are limitations and that we must make trade-offs? We have conditioned our minds to do so, and it’s a giant misconception. It’s not real. Although it’s true there are limits, those limits are NOT meant to restrict our desires, but rather to guide us towards the path to more. Hear me out on this, since I wasted a ton of money learning it (LOL!). We do not have to make trade-offs with an “OR” mindset. To reach for more, and truly embrace the “AND” that is waiting for us, rather than assuming there are limits, we must simply embrace that we can have everything we want, as long as we prioritize. It’s not about giving anything up, but instead reaching for all that we want, while understanding that we have to get there a different way. I can see relatives for the holidays or spend time with friends. I can watch this football game or that one. We can have pumpkin pie or apple pie. It’s a habitual endless charade. It does not have to be like that, and I know first-hand. When I finally challenged “or” thinking and stepped into “and,” I was driven by the quest for purposeful work. Having reaped the financial rewards of entrepreneurship, I was now hungry for meaning. 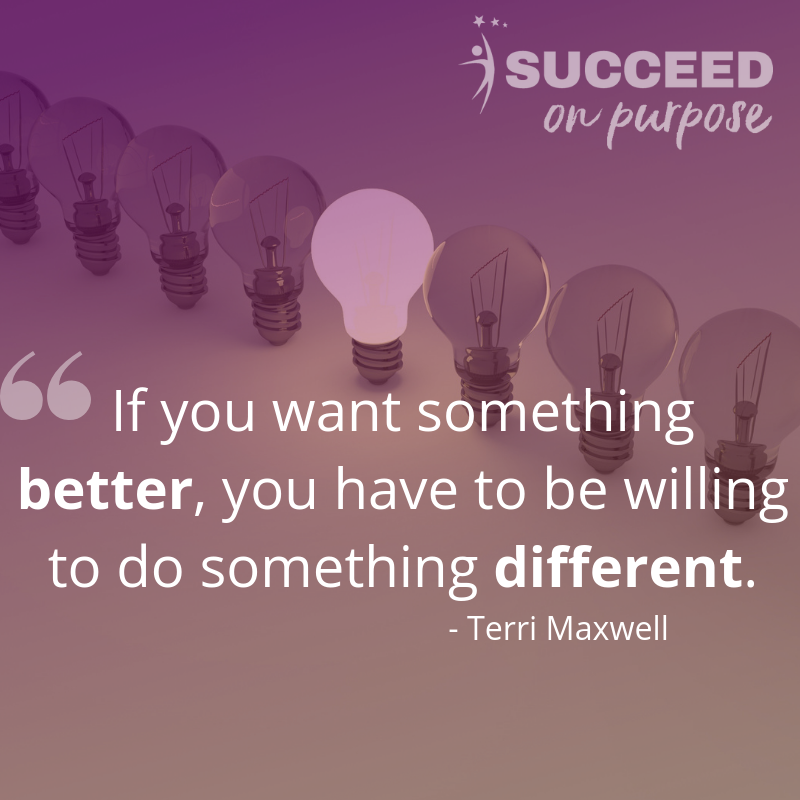 Succeed On Purpose and the Share On Purpose portfolio of companies were born out of that shift. I was tired of the constant “or” limits of life and was willing to risk it all to live in the “and.” And risk it all I did, because I did not understand how to simply prioritize my big goals and dreams. Although I am eternally grateful for the ways “and” transformed my very essence, I now know that we don’t have to risk everything to embrace the “and.” My advice to those on the quest for more is to step into the power of “and” slowly and experiment with its power in everyday matters first. “And” thinking is rocket fuel - a power so intense it requires a LOT of adjustment. Most of my failures during this journey were because I didn’t understand the power of “and,” nor how to harness the energy it generates. It’s kind of like driving a 4-cyclinder car your whole life and all of sudden you buy a 12-cylinder Ferrari, which is way more power than you’re used to. The truth is - the power of “and” requires some getting used to. Old ways of being, the ones trapped in “or” thinking, take time to undo. So, how can you gradually step into the power of “and”? 1) Start small. Find one thing you’d really like to do, on a small scale, leveraging the power of “and”. For example, rather than reinventing your career or starting that dream business just yet, try something simple. Think of it like a lab experiment and put yourself in the Petri dish. Try to list 4-5 possible “and” combinations; small scale items that you’d find pleasure in testing. 2) Focus on desire. Which “and” combo would be the MOST enjoyable? Desire fuels motivation. Choose one you really want to experience and commit to testing it in the next week. Don’t wait. Try it now before “or” clutches you back into its grasp. 3) Begin with the end in mind and get clear on what you want to create. Take time to define the vision of “and” for this small experiment. What would it look like if you could have both of the items on your “and” list? One of the reasons we stay trapped in “or” is because we don’t really know what we want. Being clear on what we want is the key to creating more. Define what your “and” looks like in clear terms. Be crystal clear. 4) Decide. The second reason we don’t make the transformation (besides not being clear) is that we don’t make a decision to change what we are doing. Make the choice to test it and start now. 5) Focus on perception rather than perfection. Don’t try to make the experience perfect. Just take a step towards what you want and observe your perceptions along the way. How do you view what happens? After all, it’s a Petri dish experiment and observation is key. - Do you judge yourself? - Was it easy? What was hard? - What is your self-talk? - Do you allow others to talk you out of what you really want? - Where does self-sabotage kick in? Why did you let it? 6) Evaluate, adjust and repeat. Small “and” steps will ensure that you retrain your mind without the added pressure of intense risk. Creating an “and” filled life is the reason why Succeed On Purpose exists. If you want help on the journey to "AND", check out any of our Free Courses.